Choosing a restaurant for a first date (or any date for that matter) could be quite unnerving. Particularly with the insane number of restaurants in Delhi, it could be difficult and overwhelming to pick one for a perfect date. But don’t worry, we’ve got your back! We’ve taken the trouble to put together a list of the 15 best romantic restaurants in Delhi for you. We guarantee you that any place from this list will completely floor your date. Take your pick, thank us later! Known for their lip-smacking Chinese food, this is the place to go if you wish to slurp up some authentic Asian cuisine without coughing up a lot of dough. With good variety on the menu and pocket-friendly prices, this joint makes the perfect, affordable choice for a date. Plus, the prompt services allows a quick fix for hunger pangs. We recommend Chilli Garlic Noodles, Schezwan Prawns, and the Khao Suey. Live performances, open-air seating and watching your pizzas getting tossed at the live counter make the already apparent charm of Imperfecto, irresistible. The Chili Chicken, Spaghetti, Mutton Keema, the delectable Margherita Pizza and Cheese Croquettes are a total bliss and a must try. It is an apt choice for a romantic candlelight dinner. Famous for its rooftop view of the Qutub Minar, this place is a popular joint in the area. It is a perfect place to enjoy those weekend evenings with your date. As the name suggests, it specializes in Thai cuisine. Served best here are Tom Yum Soup, Satay Chae, Propia Chae, Thai Curry and Prawns and Yam Woon Sen Kai, which will definitely take you on a flavourful joyride. The blue and white hues of this restaurant make a lovely ambience for a date. The food here is Armenian with a Bengali twist. The must haves there include – The Egg Devil, the Pumpkin Manti, Chicken Kalagyosh, and the dark chocolate mousse for dessert. The place has a charming vibe, and the outdoor seating is one of the prettiest. The food is out of this world and the portions are more than enough for two. The ambience here is warm and intimate. The food is simple and delicious. This classifies as a romantic restaurant because of the quiet location, where you are unlikely to run into too many people you know! Their pizzas are popular here, but you can also pick from their interesting list of mains. 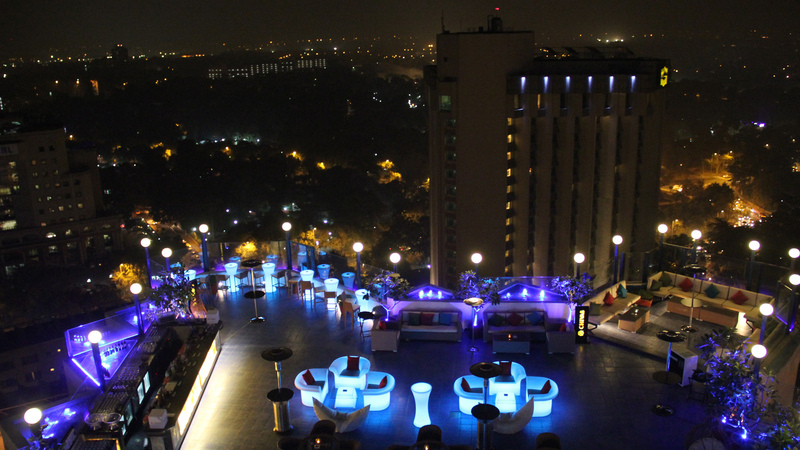 ‘SKY – Lounge Bar & Grill’,is Delhi’s highest lounge with the largest open bar, situated on the top floor of Hotel The Royal Plaza. Sky has unmatched food & beverage offerings, and an extensive bar menu featuring an eclectic selection of whiskies, wines, and champagnes along with a host of innovative cocktails. You are sure to have a memorable experience here. A beautiful open-air restaurant, this place is a must-visit. The ambience is amidst a lot of greenery, and the tents in the garden make this restaurant unique. It has both indoor and outdoor seating. They serve European, Lebanese and Mediterranean cuisines, and have a full bar with a range of cocktails and mocktails available. Make sure to try the Homemade Fig Ice Cream and Fresh Rosemary & Thyme Quinoa. Tonino is known for its elegant decor, remarkable hospitality and romantic ambience, perfect for a date. They also play live Jazz which adds to the posh and classy vibe. The staff is professional and extremely courteous. Make sure to try the Bruschetta, Tonino Fantasia, Chocolate Lasagna and Tonino Ristorante. If you and your date love Italian food, we would definitely recommend this place! One of Delhi’s most romantic restaurants, the ambiance here is fabulous and the soothing music is the cherry on the cake. The seating is surrounded by lush greenery and beautiful flowers. The Paprika Thyme Chicken, and the drink – ‘Hot Wired’ are highly recommended! 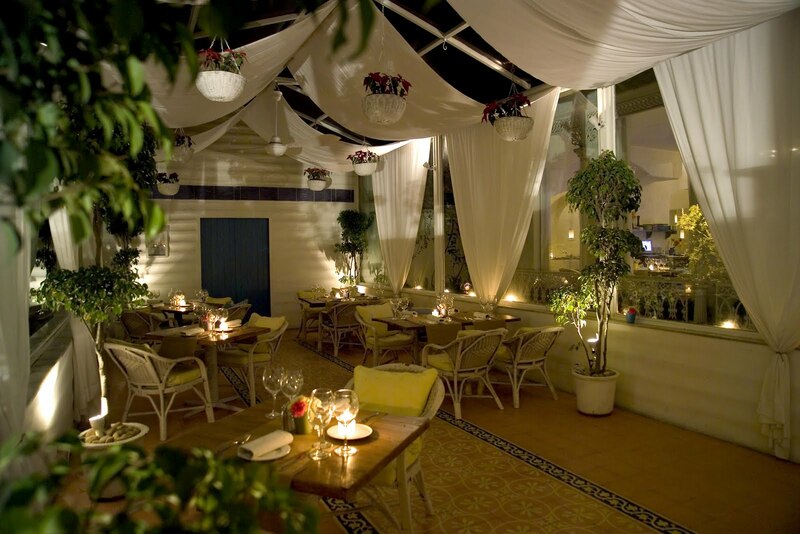 This charming Mediterranean restaurant with its beautiful white walls, white pebbled courtyard, a canopy of the Banyan tree and the star-lit tree-top terrace bar is sure to make any date special. They offer the best martinis in town which are whipped up by the celebrity bartender Zdenek Kastanek along with delicious food and eclectic music in a beautiful setting. They serve a delicious range of Italian, European and Mediterranean food and some healthy and yummy salads. Lodhi – The waterfront is a brilliant restaurant to dine at. With huge glass walls and lights pouring through them, a romantic candlelight dinner here could be a great experience. The Jetty, a private section of the restaurant surrounded by glass and water is designed for a special experience. The restaurant serves Italian, Chinese and Thai Cuisines. A truly romantic place, the ambience provides you the perfect, quiet, dining experience ideal for a date. This is one of the most romantic hotels in Delhi. When you step into the restaurant you realise you’ve stepped into a special place that is sure to impress your date We hope that a date here is the first of many more to come! Sevilla has an amazing menu of delectable Spanish and Italian food. Elegance and luxury dining all combined into one, this restaurant has the perfect romantic setting. Specialising mostly in French and Italian cuisines, this place also has a bar with refreshing cocktails and mocktails. We recommend the Morel Mushroom Risotto and the Pumpkin Soup. For dessert, don’t miss out on the creme brulee! Named after the famous Japanese Chef Akira Back, this place is extremely popular for its luxury dining and authentic Japanese cuisine. The ambiance is vibrant and soothing here and you can see the creativity in the culinary creations. This place is an ideal choice for a date. Their Sushi, Chicken Tacos with Bulgogi Sauce and California Roll are highly recommended. If you really want to impress your date, this contemporary Asian restaurant completely fits the bill. A great place for a candle light dinner in Delhi, the food here is light, wonderfully palatable and unusual. There is plush, indoor seating where you can dine in privacy, but make the most of the good season and book a table on the terrace. You get a beautiful view of the ridge, rare to find from any other hot spot in the city. Post the meal, you can sink into the couch on the terrace for the perfect after-meal drink. Make the best of this romantic dinner on the special day. We hope you have a fabulous date with one of the great options from our list! If you have anything more to add to this article, please do drop in a note in the comments section.